The Group Chief Executive and a board director of insurer Aviva Plc believes that the global financial crisis positions the insurance firms rather well. Q.The global financial crisis has changed the regulatory landscape in a major way. How has the operating environment changed for corporations such as yours? AM: It may not be overstating the case to say that things have changed. The manner in which the banks in particular have been affected by the events of the last 15-18 months, and the freezing up of liquidity and the money markets was something that nobody foresaw. I have been in meetings of banking and insurance industry leaders a number of times in the previous 12-18 months, sometimes specifically discussing what is the next big risk which will hit. I never heard anybody pick that one. So it was unexpected. The landscape that we now see, probably positions insurers… actually well. The insurers generally with the one exception of AIG (and the reason that AIG had problems had nothing to do with their core insurance operations) other insurers have come out of it pretty well. Yes, asset valuations have affected their balance-sheet and solvency margins have been reduced, but certainly as far as Aviva is concerned, it has cut into the adequate buffer that we had in terms of capital and that is what the buffer was there for—to absorb the shock. And the way our customers have behaved (has been reassuring). In UK, in October, we had three times the number of calls that we normally have with customers asking is our money safe. And we were able to assure them that it is. So while the number of calls was up, the actual withdrawals were down relatively to what we normally expect. So I expect that the insurers will continue to be regarded as a safe place for long term savings. In other parts of the business, car and health insurance, the volumes were largely unaffected. Pricing of the general insurance may be affected. In all, the industry is reasonably well positioned. In the medium term, we feel very confident about our prospects. Q. How has it affected Aviva, the way it looks at its businesses across the world? Operationally what would be the three things that you would do differently here on? AM: Life insurers when they write new business they put capital to work. I think we will be more rigorous than ever making sure that we get the right return on that capital. Secondly, all businesses in this market will be looking to control costs. We need to be vigilant in that respect. Even before the crisis hit, we had already set a target of £500 million of cost savings across the business. It was uppermost in our minds already. The third thing relates to customers—that we are selling the products that our customers want and that they need. One of the things that we are looking at is whether we should offer more guarantees to our customers to give them protection against the downside. In the United States, for example, we sell an index annuity product which you gives a fixed income return but with some upside for improvements in equity markets, but complete protection from downside moves. We have been relatively cautious. We have not made any acquisition for instance this year. And the agenda that we set ourselves a year and a half ago in terms of One Aviva, Twice the Value has served quite well in the last few months because it is focused on realising the value of our existing assets. We have had successes in that regard, but we have still more to go. At the moment, we service the guaranteed product out of the system based domestically in the country which we operate in. Going forward, the question to be asked is whether we can do it from a global platform where we can hedge the financial exposures for that product from a central platform. We are not there yet. Q. There was a lot of talk of the centre of gravity having moved east. How does that statement sound now? AM: Even three or four months ago people were talking about decoupling, Asia not being affected. Nobody is talking about it any more. Having said that, demographics driving growth in some of these countries is still quite strong. The world has changed to some degree. Recent events have served to underline that shift is going on and may accelerate it. Things have moved quickly in the last few months. Some things will come into sharper relief. Particularly, if you look at government bond issuances in some Western markets, particularly in the United States, then the reliance on overseas buyers to finance the deficit has been very important. But the call on the currency that these buyers take is very crucially important for their appetite to those sorts of assets. Q. How much of the pain is still left in the system? AM. If you look at the equity markets, then I do not think that you can be sure that we have seen the bottom in the last few months. On the credit side, the credit spreads are indicating very high level of defaults relative to history. And one can’t be sure that it will be better or worse. In managing a company like Aviva, you have to have regards for the further downside that could happen. And we certainly have. To use cricketing analogy, you are playing defensive right now, but there will come a time sometime in the next one year when you can be on the front foot and be a little expansive, but it is hard to say when that would happen. Q. What does ‘One Aviva, Twice the Value’ mean? AM: The company has been working in separate countries as separate businesses. One Aviva is all about making the whole business work as a group. And in the last 18 months we have had some good strides on that. Sometimes it is cost savings, its shared services, sometimes it is about bringing the expertise from one market to another. Say, making bancassurance sales work in a country as well as they do in Spain. Another very important element is working under one brand across the world. Of the 27 countries that we are present in, in 23 countries we work as Aviva. By the end of next year, only one country will be left with a separate brand. That is going to be very powerful for our customers and our staff. And it will save us money. And the time is right. On the twice the value side, we believe there are tangible benefits. We set ourselves the target of doubling our earnings per share by 2012 at the latest. And we remain in position we think that is attainable despite the tribulations of the last six months. This year’s earnings per share will be affected but I still have the confidence to say that it is still a realistic target. And that is very reassuring for our staff. Aviva Investors is a part of this initiative. Our asset management business is ranked 20th in the world and has £300 billion under management. It brought 15 different businesses in 15 different countries under one brand and making sure we get the benefits of working together. Credit analysis for example which can be done across markets, but historically we have been doing it in 15 different places. There are some simple efficiencies that one can get. We see fund management as the third important pillar of the business along with life and pensions and general insurance. Q. You spoke about transforming the general insurance business in recent comments to investors. How would you propose to restructure the business? AM: We intend to make £350 million of cost savings from the UK general insurance business and that is starting from a cost base of £1.4 billion. So it is a meaningful percentage. And it is an ongoing transformation and by the end of next year we hope to be employing 3,000-4,000 people less in that business. We are aiming cost competitiveness. Aviva is the world’s fifth-largest insurance group, and the biggest in the UK. Its business spans life, pensions, general insurance and fund management. Aviva has a customer base of 45 million in 27 countries and £359 billion of assets-under-management. It provided £400 million for defaults already reported due to Lehman Brothers and AIG by end-September 2008. Results over the next few quarters may provide more details. In India, the company traces its history back to 1834. It claims to have been the largest foreign insurer at the time of nationalisation. Q. Have people and talent been a challenge in recent times? AM: All companies like us do well only if we have great people working for us. It is true in India and it is true anywhere. As part of One Aviva five things have to be done centrally in the group, and talent management is one of them. It is essentially for Aviva to transform from a UK-based group to a global group. And one of the things about global groups is that they genuinely find talent in all parts of the world and put that to use in different parts of the business. Equally what we have done in the past few years is that it is not just from the UK from where senior leaders in our business will come from in the future. We have put in place a system called Talking Talent which much more carefully and systematically evaluates talent and talks to people about their career and growth. And as a result we are already seeing a lot of movement around the group. We have also made some important hires into the group. And Ram (TR Ramachandran) is an excellent example of that in India. Q. What are the growth projections for India in the years to come? How do you see its contribution to the global balance sheet going forward? AM: India is a fascinating country. Its contribution to the global balance sheet has to go up, but it is tiny at the moment as a part of our business. But it punches way above its weight in terms of its importance because of its growth prospects inherent in the market. Simon Machell: India is a very young market. We have been here six years and the market has changed significantly in that time. It is still a demographics-led market. It is all about building right products for the right customers at the right time. We expect the Indian market to grow 30-35 percent over the next three years. That is what we have said publicly. But it will be tough to put a number to that. Q. Where will be the emphasis be in terms of Aviva’s operations in India, given that growth is a given? AM: It is very important not to be just talking of topline growth. It is easy to get topline growth in insurance business. The trick is to get topline growth and then working through to the bottomline. We have been pretty successful in many countries where we had young businesses like we have in India. Wherever we operate, we wish our company to be thought of, even if it is not the largest, in the ethical and compliance stance that we take, we aim to be eminent if not pre-eminent in that regard. We take that very seriously. And we do that because it is the right thing to do but also because over time it can cost a lot of money in the long run. So, it would be fair to say that we will from time to time not write business in way some of our competitors would. And I and my board would be perfectly happy to see that. We believe in the long term we believe reputation of the company is a very important asset that needs to be nurtured. Q. India has been big on unit-linked plans and pension products. Given the state of the equity markets, how do you see the Indian market responding to new products such as capital guarantee products? And what is going to be Aviva’s strategy? AM: We are looking potentially at least at guaranteed products… Of course, we would like to give our customers the best of both the worlds, but the truth is that it has a price attached to it. It is not always obvious to the customers what the genuine value of those guarantees is and I am not talking about India here but more broadly. And pricing such products can be challenging. Ram can probably give more details. TR: We are evaluating a quasi-guarantee product. The suite of current products we have we have products skewed towards cash and cash equivalents, which de facto serve the same purpose from a customer perspective. A couple of those products will be launched. Riding on the favourable demographics, the child space is something which we strategically want to own. Our product and actuarial teams are working on a few interesting ideas in the protection which we hope to announce shortly. Q. How do terrorist events like those in Mumbai redefine risk for insurers such as Aviva? AM: If you go back 25 years in the UK when the IRA was attacking mainland UK, there was a specific insurance response to that because lives as well as buildings were under attack. There was a government-sponsored re-insurer company called Pool Re was set up. When things become as serious as they were then in the UK, government and insurance industry have to get together to find the right answer. The private insurance industry will not be willing to accept all the risk that goes with it. If you get a big, one-off incident like the tragic events in Mumbai repeated a number of times in a number of places, and people begin to believe that it has become a part of everyday life. I think it is a different type of threat. Q. India is also looking at opening up the new pension scheme to private pension players. What is the opportunity that you see and what is the value that Aviva can bring to the market in India? AM: It is interesting for India and companies like Aviva have hundreds of years of experience writing that sort of a product elsewhere in the world. It would be beneficial to open up that sector. And certainly we would like to play a leading role in that space for sure. SM: We are excited about the pensions market opening up. We wait with interest to see how the rules will work and how we can fit into that. Q. Any chances of bringing the general insurance business to India? AM: It is something that Simon and I talk of from time to time. It is certainly on our list of priorities. SM: “India is such a large market that to be present in the general insurance space in an effective way you need to have a massive infrastructure. We had a general insurance business in Asia which we sold about five years ago. I suspect there will be other markets that we might try entering which we will try and enter before we enter India because they are more containable and easier in size than the Indian market. Q. There is some movement forward on increasing the foreign investment in insurance and Aviva has been a big votary of that change… how would your business plans change? AM: I am not sure exactly when the cap might be raised. We are encouraged by more recent developments on it. We have been pretty clear that if we are allowed we will move fairly quickly to increase our stake to 49 per cent. And that remains the case. Q. In terms of capital requirement while Aviva even as it increases stake and its partners can continue to add to the capital base, how soon do you think there is a likelihood of the Indian venture seeking external funds—whether PE or public listing? AM: I am not sure that we need outside money for our foreseeable plans. We go back to the point about how big India is relative to the group. Aviva Plc generates a lot of capital in the rest of the group and we use some of that to pay dividends but we are always looking to invest funds for growth in other parts of the business. That is what we have done in India till date. And that is how I see it working. Q. Does the Indian market lend itself to some M&A activity in the near to medium term? A: We had a very careful look over the last couple of years at Asia Pacific… there isn’t much and whatever there is a little expensive. Now the world is changing and it is too early to say what change that might bring but my fundamental view on that wouldn’t be changed at the moment. We have done very well growing this business organically. The growth prospects are still very good. The execution risk is lower if you invest in your own business. Operationally, what would be the three things that Aviva would do differently in future? AM: Life insurers when they write new business put capital to work. I think we will be more rigorous than ever in making sure that we get the right return on that capital. Second, all businesses in this market will be looking to control costs. Even before the crisis hit, we had already set a target of £500 million in cost savings across the business. The third thing relates to customers— that we are selling products that our customers want and need. One of the things we are looking at is whether we should offer more guarantees to our customers to give them protection against the downside. In the US, for example, we sell an index annuity product that gives a fixed-income return with some upside for improvements in equity markets, but complete protection from downside moves. What does “One Aviva, Twice the Value” mean? AM: “One Aviva” is all about making the whole business work as a group. In the last 18 months, we have had some good strides on that. Sometimes it is cost savings and shared services; sometimes it is bringing the expertise from one market to another. Say, making bancassurance sales work in a country as well as they do in Spain. Another important element is working under one brand across the world. Of the 27 countries, we are present in, in 23 we work as Aviva. By the end of next year (2009), only one country will be left with a separate brand. On the “Twice the Value” side, we have set ourselves the target of doubling our earnings per share by 2012. This year’s earnings per share will be affected, but I still have the confidence to say that it is a realistic target. Have people and talent been a challenge in recent times? AM: As part of “One Aviva”, five things have to be done centrally in the group, and talent management is one of them. 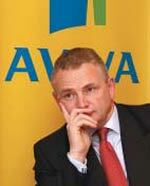 It is essential for Aviva to transform from a UKbased group to a global group. We have put in place a system called “Talking Talent”, which carefully and systematically evaluates talent and talks to people about their career and growth. And as a result, we are already seeing a lot of movement around the group. We have also made some important hires into the group. And Ram (Aviva India CEO T.R. Ramachandran) is an excellent example of that practice.